On Saturday, runners participated in the 20th annual Lakefront 50K George Cheung Memorial Race. This ultramarathon is a staple in the ultrarunning community and organized by co-race directors, Pat Onines and Jeff Fleitz. Pat and Jeff are heavily involved and supportive of the ultrarunning community. In fact, Jeff finished the Paleozoic Trail Race 50K as the second place overall male finisher just a week ago; goes to show that runners put on the best events for their fellow runners. 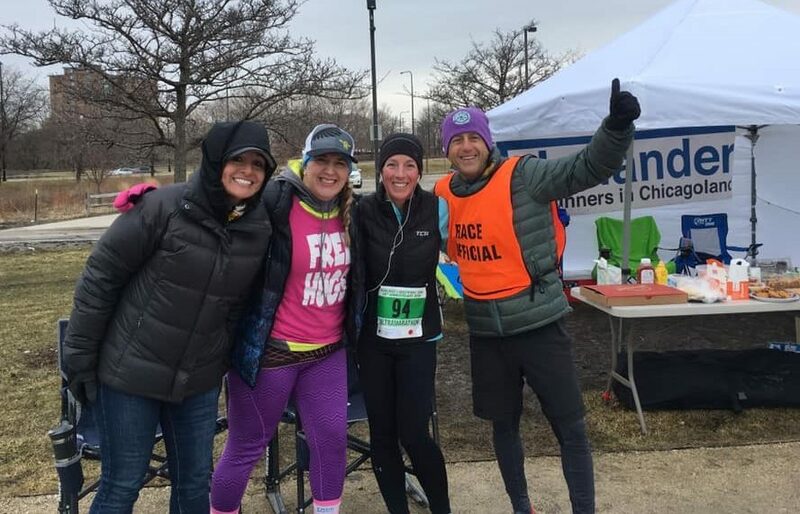 The Lakefront 50K was extremely well organized and runners arrived knowing exactly what to expect of parking, course markings, weather conditions, and aid station support. Runners began and ended at Jackson Park, just off of Lake Shore Drive. Parking was super convenient and affordable. I paid $8 to park for five hours, a steal for city parking! The parking lot was located near packet pick up, which was set up under a viaduct to protect against the iffy weather conditions that presented themselves throughout the morning. Tarps were set up for bag drop and most runners took advantage of the convenient location which we would pass at every loop. The morning was low key as runners gathered near the start line, chatting with each other and waiting for RD, Pat Onines to signal go time. At promptly 8:30 a.m. Pat signaled the start and runners began their 50K trek. The course consisted of 3 out and back segments for a total loop of just over 10 miles. The route was entirely on the pedestrian path of the Chicago lakefront path with the beautiful scenery of our fine city and lakefront. With the beauty that is Chicago, also comes wind! Without breaking the cardinal rule of the RD’s, “No whiners allowed,” I’ll diplomatically say that the wind provided a challenge on the outsegment of the course, while it provided assistance on the backsegment of the course. As I used this race as a long training run for Boston, the wind was ideal in simulating the hills that I will face there. Scotty Kummer, Ten Junk Miles Podcast creator and host, has often referred to the Lakefront 50K as the gateway drug to ultra’s, and I can certainly see why. This low key race offered a scenic, flat course, with the friendliest runners I’ve ever raced with. Nearly every runner I passed on the loops gave me a cheer, a wave, or a high five. It was also great to have TJM hosts, Scotty Kummer and Rachel Ingle tackling the course like beasts alongside us all! Holly Lindroth, also a TJM host, helped to man the Flatlanders Aid Station, which was filled with friendly cheers, snacks of all kinds, and a healthy serving of some classic punk rock tunes. Situated about three miles into the course, runners gained an extra boost of energy from the Flatlanders volunteers as they passed the aid station twice on the 10-mile loop. One of the greatest things about the Lakefront 50K is the support and positive energy you feel by the RD’s, volunteers, and runners. At every race he directs, RD, Pat Onines starts off by asking everyone to repeat after him, and he says “There is no place I would rather be, than to be here, with you, right now.” I truly felt that way about each and every race volunteer, staffer, and runner. What a way to spend the spring-ish morning. All runners received a short-sleeved technical t-shirt and medal. To celebrate the race’s anniversary year, all runners who completed two or more loops received an etched pint glass denoting the race. An awesome keepsake for sure and one that I used immediately when I returned home. First through third female finishers were: Rachel Ingle, Diana Angel, and Greta Kauffman. First through third male finishers were: Matthew Diamond, Matthew DuBruin, and Mark Eisenman. The Lakefront 50K has a sister race which takes place in the fall, the Lakefront 50/50, consisting of a 50 mile and 50K option. This race will occur on Saturday, November 2, three weeks after the Chicago Marathon and will be held on the north side starting at Foster Avenue Beach House. Watch for registration to open on their website in May – http://www.chicagoultra.org/. When I initially reached out to Lakefront 50K, race director, Jeff Fleitz, let me know that US Army Commander, Andrew Heymann, would be running the race virtually in Iraq, looking to achieve his first ultra-finish. Look for an in-depth interview with Andy later this week about how he accomplished his mission!